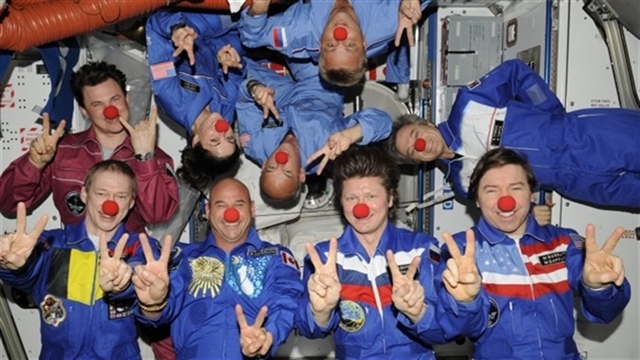 Guy Laliberte, the last space tourist, aboard ISS with station and shuttle crew in 2009. Laliberte’s flight cost $40 million and involved three Soyuz capsules (Credits: NASA). First there were the rumors of a new tourist to visit the International Space Station. Then Roscosmos announced approval of an extended one year mission to the station that would make room for such a tourist. Finally, on October 5 NASA made it official. In the spring of 2015 one Russian and one American will launch on a year long experiment living aboard ISS. Today, crews remain on the station for approximately six months – although that may be lengthened or shortened to account for changes in launch schedules. Although Russia has accomodated tourists on ISS in the past, they are not able to make room in the Soyuz capsule for the journey while also providing continuous ferrying for six person crews. Only three individuals fit in a Soyuz. In the past this problem was alleviated by flying astronauts on the Space Shuttle. With no secondary crew transportation vehicle available, the only way to fit more people is for some of them to stay longer. By moving two crew members to a year long rotation, room will be made for two tourist flights during their stay. The announcement comes just days after ISS Expedition 32 Commander Gennady Pedalka made public comments about the impossibility of living aboard the Russian segment of ISS for a year under current conditions. He cited cold, noisy, and overstuffed living spaces, amounting to about one seventh the area available to those living on the US side of the station. It is not clear how much this experiment is being driven by economic factors. Although both NASA and Roscosmos have publicly mentioned the idea of fielding a year-long mission on ISS, this announcement comes only after Sarah Brightman reportedly outbid NASA for the chance to fly to the station. NASA currently pays $51 million per seat on the Soyuz capsule. The previous ISS tourist, Guy Laliberte, paid $40 million.